1) Come to the UPC Workshop. Members of UPC will gather on Saturday, January 19, to cut, paste, and fold materials that will be used in Haiti at the teacher workshops. If you would like to help, please come to Dunham Hall at 9:00 a.m. and join the team. No skills required. If you can count or bundle up materials, you are qualified! 2) Save your magazines. Colorful pictures cut out from magazines are indispensable to various projects at the Haiti workshops. Bring the pictures (or magazines) to the narthex on January 6. Or bring them to the January 19 workshop in Dunham Hall. 3) Contact Lisa Lord (elisabethlord@icloud.com or 919-490-8635) to help with special projects. Many thanks to the UPC community for continuous support of the Haiti teacher training project. 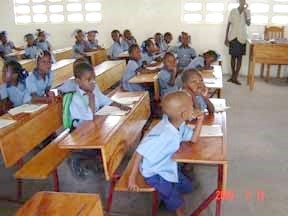 The 120 Haitian teachers who benefit from your generosity are very grateful.